IT'S TIME TO REALIGN some of the properties I have online to give them a more sustainable foundation. David Armano proposes a starting point. In my case, it means trying to attract more mobile readers, since I know my demographic has shifted well beyond desktop browsers. If you're reading this blog post on a mobile screen, you'll start seeing my stuff again through a better presentation, one optimised for faster displays. The raw numbers shown in the screenshot from Typepad's stats server (above) reduce my nine years on Typepad to an easily-documented fact--I've declined from more than 1000 daily readers in 2002 to fewer than 400 daily views in 2012. That trendline isn't the whole story, however, because "reach" has replaced "readers" as part of the analysis. 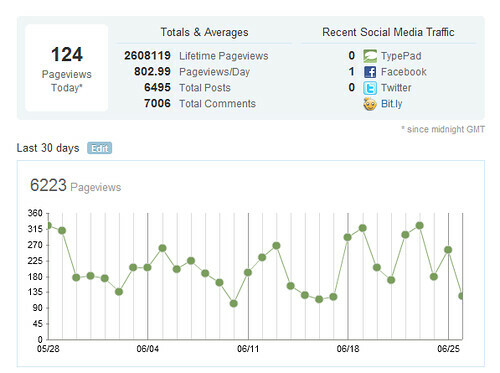 Back in 2002, my blog didn't reach into social media, Tumblr, Scoop.it, Feedburner, Slideshare and YouTube. All those touchpoints play a part in how I need to audit my footprint in order to invoke a proper sustainable strategy. David Armano -- "From Island to Ecosystem" on Logic + Emotion, June 25, 2012. Bernie Goldbach curates links about blogging.